This morning students around the country are gathering at flag poles on their school campuses. It is a morning to stand and be counted. A morning to lift up to our God prayers for our friends, family, schools, administration, teachers, city, state and national governments. I will be spending my morning at Oakland Middle school where I am predicting 150+ students will gather in Jesus’ name to pray. It is an honor to stand among them. Whether a single student standing alone, two or three huddled together in unity, or hundreds gathered in front of the school, See You at the Pole is about students praying for awakening on campuses all over the world. Pray for these teenagers today that as they take a stand on public property and exercise their religious liberty, they will be a light that points not tho their own spirituality or goodness, but to Jesus. For He is the only hope for our schools, our nation, and our world. To Him be the Glory this morning. 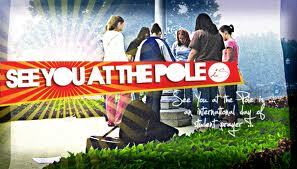 If you are reading this before 7:00am, hey, I’ll see you at the Pole! Here are some quick links if you want to learn more about this national movement.